We are writing you today soliciting help identifying candidates for our Research Experience for Undergraduates (REU) program in Chemistry and Biochemistry (broadly defined). Our REU program is unique in that we are focusing on providing students with disabilities a research and community building experience tailored to fostering success in graduate school and beyond. The REU program is scheduled from June 19, 2017 to August 11, 2017 at the University of Delaware. The application is due March 31, 2017. More information can be found here: http://sites.udel.edu/seli-ud/ and on the attached flyer. If you have any questions please contact us at research-experience@udel.edu. Because of continued interest in the Woodrow Wilson Teaching Fellowships, this year’s application deadline has been extended. The WW Teaching Fellowships will continue to accept applications in our partner states–Georgia and New Jersey–through February 26. This is an unparalleled opportunity for recent graduates or career changers to pursue a STEM teaching career while receiving exceptional benefits and support along the way. If your organization’s members may know of former colleagues, friends, or family members who would be good candidates for this prestigious Fellowship, please forward this email to them and ask them to encourage those individuals to apply. The WW Teaching Fellowship provides top applicants with excellent opportunities. Fellows receive a generous stipend ($30,000); admission into a competitive master’s degree program; extensive preparation for the classroom; ongoing mentoring; teacher certification; and more. In return, we ask Fellows to commit to teach for three years in a high-need school. We often hear from our most successful Woodrow Wilson Teaching Fellows that they found our program through recommendations from colleagues like you. By forwarding this email on to a potential Fellow, you will not only expose that candidate to a rich educational opportunity, but you will also be helping the students whom that person will one day teach. 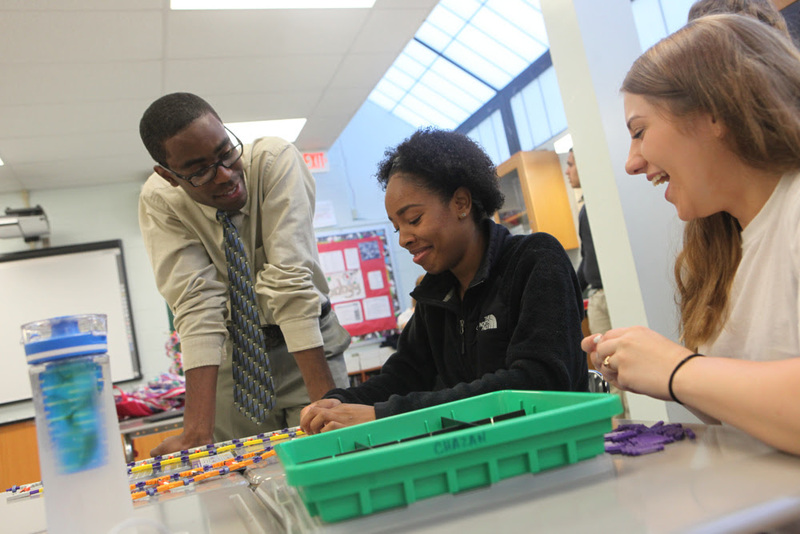 For more information about the WW Teaching Fellowship, please visit http://woodrow.org/STEM. Thank you for your support during our recruitment cycle. We look forward to hearing from any candidates you or your organization’s members can refer to us. The Western New York section of the American Chemical Society will hold its 10th annual Undergraduate Research Symposium on Saturday, April 8, 2017 on the campus of Niagara University. The event is being hosted by the Department of Biochemistry, Chemistry and Physics and the Niagara University Student Chapter of ACS. The Symposium will feature a keynote address entitled “Surface Analysis Across Disciplines” by Dr. Christine M. Mahoney. Dr. Mahoney is currently a Senior Research Scientist at Corning, Inc. and she previously held senior research positions at several national labs, including NIST and Pacific Northwest National Lab. There will be prizes for the best student posters and oral presentations. There is a $5.00 registration fee for this year’s symposium. This includes a light breakfast and buffet lunch. A vegetarian option will be available. We ask that attendees register using the attached form and pay (cash) at the registration table when arriving at the symposium. For undergraduate researchers who wish to present a poster or a 10-minute oral presentation at the symposium, please provide this information on the registration form, and submit an abstract via email using the attached Abstract Template. Acceptance of presentations will be on a rolling basis while space remains in the sessions, with final important deadlines below. 9:00 am-10:00 am Keynote presentation: Dr. Christine M. Mahoney, Corning, Inc. If you know of a researcher or faculty advisor who may not have received this notice, could you please pass on this information? Thanks. We hope to see you in April! Please note that several executive and upper level positions including, but not limited to, the Editor-in-Chief (EIC), Chief Executive Officer (CEO), Chief Communications Officer (CCO), Chief Development Officer (CDO), and Senior Research Editor (SRE) have opened up recently. There, you should find a brief description of the position as well as a link to the application form. Feel free to email Daniel Chapman at eic@jyi.org or any of our executive staff at info@jyi.org if you have any questions. This is an opportunity to help young scientists who are headed towards careers in environmental science and environmental engineering in Ohio. As such, please share this scholarship offer that The OhioEPA offers in conjunction with The Ohio Academy of Science. The Ohio EPA Scholarship is a merit-based, non-renewable scholarship and is made available to students who have an overall GPA of at least 3.0 and provide letters of recommendation and evidence of career motivation. Up to $2,500 is available for students entering their final year of a four-year degree program and $1,250 is available for students entering their final year of a two-year degree program. Students may be directed to the OAS web site at OhioEPA Scholarship for further information and application instructions.